Experts from across the U.S. attending the burrowing owl symposium last month in Umatilla, Ore., may have outnumbered the species’ dwindling population in the Mid-Columbia. Thirty-five wildlife specialists concerned about the future for the diminutive owls talked about why they believe the endangered bird seems to be losing habitat and population across the Western U.S. and Canada. Burrowing owls – a species distinct to the Americas – have been known to nest in areas from Saskatchewan, Canada, south through the Dakotas and western Oklahoma and Texas into Mexico, while reaching westward into California, Oregon and Washington. Burrowing owls, which are about 10 inches long, use vacant burrows dug by badgers or coyotes for their nests. They feed on mice and insects such as beetles, grasshoppers and Mormon crickets and tend to return to locations where they have nested before. Despite 80 years of banding burrowing owls in an attempt to follow their life cycle and travels, there is scant data to study, said David H. Johnson, executive director of the Global Owl Project based in Alexandria, Va. Fewer than 400 of the banded birds have been recovered since the 1920s, which is not enough over such a long period to provide meaningful information. With a lifespan of about seven years, burrowing owls provide researchers too little time for an effective “catch-band/release-recapture method” of tracking the birds’ habits. Heidi Newsome, a wildlife biologist with the U.S. Fish and Wildlife Service McNary Refuge Office, said researchers do field surveys every spring to check on known burrowing owl nesting sites on the 195,000-acre Hanford Reach National Monument. The survey’s database has 84 known sites, but most are abandoned, destroyed or unused for several years. “The number of burrows we check annually is the same, but the number that are occupied keeps going down. Now we have five,” Newsome said. “It’s the same in Colorado,” Johnson said. The situation is critical in Canada, where Johnson said the known population of burrowing owls has been dropping 16 percent a year for years. “As to the cause, that still a big question,” he said. Some hopes lie in new technology that could help track burrowing owls, the success of artificial burrows and various mapping projects across the owls’ extensive Western range. 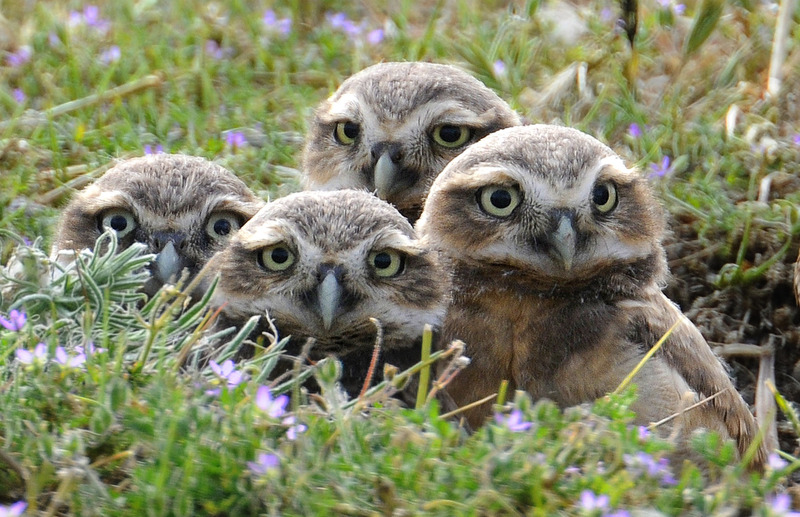 Burrowing owls are considered a “species of concern” by the U.S. Fish and Wildlife Service and are listed as endangered in Canada and threatened in Mexico. In Washington, they are listed as a species of concern by the Department of Fish and Wildlife. Last year, Audubon Society members asked the department to declare them threatened or endangered in Washington. In its request, the group cited in part a loss of the birds’ shrub-steppe habitat from urban development and agricultural practices that have led to a “rapid decline” in the population. But the department’s threatened and endangered species office is understaffed because of budget cuts, which has slowed work on the state’s review of possibly listing the burrowing owl as threatened, endangered or sensitive, said Charlotte Reep of Lower Columbia Basin Audubon. “If we don’t get this office to respond soon, we won’t have burrowing owls in Washington, let alone Benton and Franklin counties,” Reep said in an e-mail.